We’ve ventured into a good thing with our Web Wednesday highlights and interviews. Our talks with De Miller Jackson and Andrew Kreider have garnered some great response, giving us an insight into what strikes them poetically. The next selection for this “honor” is a woman whose poetry and attitude have touched a chord with me, and stirs this confession: she was the inspiration for the idea of adding this feature to POETIC BLOOMINGS. We share a fascination and faith in the existence of a certain red feathered bird. In her blog “Conversations with a Cardinal,” Laurie Kolp expresses her thought on the subject. But indeed, this spot is secondary to her “other” blog, where her poetry flourishes and takes on life. Fittingly entitled, “Conversations with Laurie,” it becomes a perfect lead-in to our chat. I proudly re-introduce you all to Laurie Kolp. 1. Laurie, we began Andrew Kreider’s interview inquiring about the penguins in his life. I happen to know cardinals have played a special role in yours. Our readers have the opportunity to visit your blogs, but briefly, please tell us your story of the cardinal and its inspiration. First I’d like to thank the both of you for what you’ve done and still do for the poetry community. 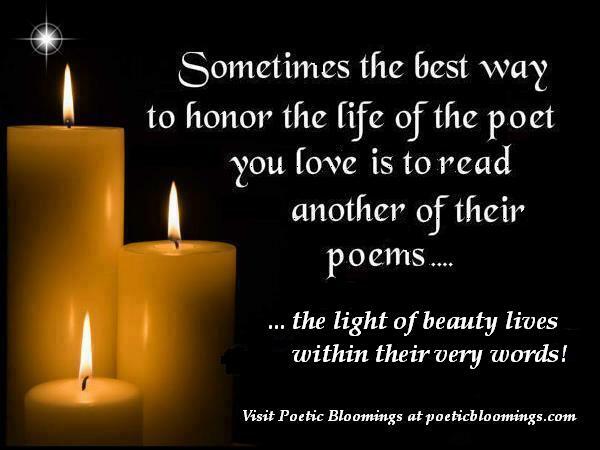 I love Poetic Bloomings and am honored to be included in your Web Wednesday highlights. Shortly after I began blogging, a dear friend of mine, Mary, committed suicide. The first experience I had with a cardinal was only days after her death. I was sitting in a meeting room at our church where we used to gather quite frequently. I was trying to keep my composure, but my tears kept sneaking out of staring eyes. I remember looking up while rolling a soggy tissue between my palms. I asked God to show me a sign that my friend was okay, to please let Mary know I’m sorry and that I miss her. (You see, everyone who is affected by suicide always thinks they could have done something to prevent it). When I left the meeting and was driving through the parking lot, a cardinal flew right in front of my windshield, landed on the ground, and then hopped across the pavement. It was like the story, Make Way for Ducklings, only it was a cardinal marching across the road instead of ducks. I had an indescribable euphoric feeling of peace and comfort. I knew without a doubt that God had heard me. I went from sad to happy in an instant. The cardinal then flew to the fence beside the driveway and just stared at me. Another time I gave a “Sisterhood Award” to Mary’s sister. After I notified her of the award, I looked in my backyard and it was swarming in red. There must have been a dozen cardinals! These are only a few of the many synchronicities that have occurred and still do. I am so grateful I still experience cardinal joy three years after Mary’s passing. Who only wanted to be free. Like a ship that sails the sea. Wore her life too thin. Never knowing what to do. And still have lots of fun. Given time for peace within. With a bullet through her heart. I will turn to God instead. 2. As I had recounted on your “Cardinal” blog, I had similar experiences with a pair of cardinals in relation to the passing of my parents. There was a solace brought about by the appearance of these glorious birds. Tell us what they personally have brought to your life. I was so happy when you shared your experience with me, Walt. Thank you for doing that. Several others have, too. One day I’d love to publish a collection of all the cardinal stories! For me, the cardinals offer hope and reaffirm my faith. Did you know the beautiful red birds are regarded by Native Americans as highly spiritual? They believe cardinals symbolize self-worth, creativity and intuition. Their chirps remind us to listen closely and pay attention. The cardinal’s bright red color reaffirms that everything we do is meaningful and colorful. We are all connected, and many Native Americans believe that loved ones who have died come back to visit in the form of cardinals. Keep reading and you’ll gain a deeper understanding of how this all comes together for me. 3. We’ve mentioned you have two blogs: “Conversations with a Cardinal,” and “Conversations with Laurie.” This sparks a two-part question. b. How does each blog serve your writing needs? One of my first big projects was writing my memoir. I was very possessive of this and scared to expose myself by letting anyone read it. My husband hadn’t even read it! Mary took a great interest in my writing and convinced me to let her read the memoir. She came over to my house every day. We sat together at the computer until she had read the entire manuscript. We had conversations about our pasts and discovered we had much more in common than we originally thought. We had just taken different paths. I tried to help and encourage her in the problem areas of her life. At the same time, she believed in me, made me feel confident and good about my writing. It was a two-way street, just like a conversation should be. Because of her initial supportive shove, I have been able to open up and share more of myself through my writing. Conversations with a Cardinal symbolizes the friendship we shared and my promise to pursue my writing. I now use it as a personal writing blog. Conversations with Laurie has evolved into my poetry blog. 4. “Let your conversations be always full of grace, seasoned with salt, so that you may know how to answer everyone.” This quote from Colossians 4:6 welcomes us to “Conversations with a Cardinal.” It seems this is becoming a standard question, but you are another who is obviously a woman of faith, so … what role does your faith play in your creative writing? A huge role! Not only does my Higher Power put words, phrases, and ideas into my head, He also gives me courage to put my work out there. I have to be spiritually fit and willing to listen, though. When my mind is obsessing on overblown nonsense which I have no control over, I’m not able to hear my inner voice. I’m not saying I always do this (because sometimes I beat myself up and worry unnecessarily), but when I submit a piece and leave the results to Him, I feel so much better. It’s really no reflection on me whether the editors like it or not; in fact, it’s none of my business. If it’s meant to be, it will get published. If not, then maybe I have helped or entertained someone through sharing. Only then is my writing a real success anyway. 5. As most of us here are well aware, the month of April celebrates poetry. Many of us (including you, I’m glad to say!) participate in the Poem-a-Day Challenge at Poetic Asides with Robert Lee Brewer. April not-withstanding, do you find time to write poetry nearly every day? Most certainly! Writing poetry is part of my morning routine: a cup of coffee and a poem. I think it helps to have a support group, though. Thanks to Poetic Asides, I became a member of a poetry group three years ago. We called ourselves The Baker’s Dozen, and we were from all over the world. Every day we wrote poems from prompts we had agreed upon and shared them with one another. I feel like I became a better poet because of them. 6. We are pleased to see you have successfully published several short stories, and have participated in NaNoWriMo. What are your aspirations (if any) for a novel in your future? Or possibly a collection of your wonderful poetry? Yeah, NaNoWriMo was intense, but I really liked working under the pressure. It was a challenge to complete a novel in 30 days; and when I did it, the sense of satisfaction was overwhelming. Many of you know Pearl (Dr. Pearl Ketover Prilik- “Imagine” http:drpkp.com). I couldn’t have done it without her support and encouragement. For some reason she found me on the NaNo site and started cheering for me just like Mary had. I began to do the same for Pearl. We’d send each other little messages with rhyming cheers. The support really kept me going. Imagine my surprise when one day she sent me a note asking why the cardinals on my blog. Come to find out, she had experienced cardinal comfort after the death of her father. For me, it was an affirmation that someone up above was rooting for me, too. I always have a lot of projects I’m working on. I do hope one day to have a published book of poetry and short stories (and maybe even a novel), but I’m not in any hurry. I feel like if and when the time is right, everything will fall into place. 7. What do you enjoy more: your short stories, or your poetry? Why? You know, I’m like a pendulum. I’ll go for awhile focusing on short stories, and then I’ll swing back to poetry and concentrate on that. I really like both, but if I had to choose one as my favorite, it would be poetry because it seems so natural to me. I can work on a poem and complete it in a short amount of time. I like the immediate gratification. 8. Marie seems partial to the sonnet form. “I Am the Sea” is one of our favorite poems of yours. Apparently, it was one of Robert Lee Brewer’s as well, as it was chosen as #3 in his sonnet contest. Congratulations on your well-deserved accolades, Laurie. Can you share with us the inspiration for this entrancing sonnet? Thank you! It’s funny how things go sometimes because I was drowning in a wave of self-doubt when I wrote I Am the Sea. The poem symbolizes what writing is to me… I am at peace when writing; and the ocean waters pacify me, too. I sometimes have a “feud” with myself when rejected, but always bounce back because it’s part of who I am. I spent years searching for my purpose in this world, and even though I wrote all the time as a child, I tried my hand at teaching and other things. When I found my way back to writing, which was after I became a mother of three, it was like I was home at last—like a dolphin in the sea. 9. Is there a poetry form to which you are partial? I used to only write rhyming poems. The Baker’s Dozen gave me courage to branch out into free verse and non-rhyming poetry. I love the challenge of writing form poetry, but my favorite has to be the meditative aspect of small stones (daily observations). Writing small stones, which I will be doing daily in July, helps me stay in touch with nature and my surroundings. 10. Finally, do you have any advice for young aspiring poets (or old irascible nudges like Walt who are always willing to learn something new) about the process of this poetic life we lead? Poetry is an art form; and like art, everyone will interpret it differently. Some will like what you write, others won’t. Some might even give you a new understanding or perspective of your work (which I love). But it doesn’t mean it’s not good. Try to keep the joy in writing poetry instead of making it into a stressful quest for publication. Write every day whether you want to or not. And get involved in active online communities such as Poetic Bloomings and Poetic Asides. To me, it’s all about SUPPORT. We need each other. Don’t give up, because you never know what’s waiting for you right around the corner. Laurie, we are extremely happy that you have accepted this long-overdue accolade. Thank you for sharing a piece of yourself with us. Yay, Laurie!!!!!! I am so glad to see you highlighted here. Congrats! Wonderful interview! Laurie, thanks for sharing yourself with us, and for the encouragement to keep writing, whether we want to or not! Love your work. Thank you Paula, Linda and Andrew… I appreciate your support! And thanks again to Walt and Marie for believing in me. Laurie has asked the question and I'm sure others wonder. How was she the inspiration for Web Wednesday? I wanted to delve into the Cardinal aspect of Laurie's blog further, but then I was swayed away to more concentrate on her poetry, which is why we're here to begin with. I was trying to work my own cardinal story into something to submit somewhere. Just too busy to get very far with it. I thought Laurie would inspire me to continue with it. She did. Marie loved the Web Wed. idea and ran with it. The direction she chose was perfect. That's it in a nutshell. Love this! LOVE Laurie, and her poetry! "I am the sea I write to fill this hole…" Ahhhhh. Perfect. Wonderful interview. So glad to learn more about Laurie! Wonderful interview, both the dialogue and the poetry. Thanks! I enjoyed reading this interview. Well done! A very enjoyable read. I have always thought that Laurie's poems were inspired, and now I know why. Thank you, Laurie, Walt and Marie! Wonderful interview and a great job on the poem specifically written for this blog, Walt and Marie! Laurie, this is an awesome interview. You are deserving of the attention and accolades. Your inspiration is immeasurable! Thank you for sharing yourself!! Fantastic interview! Always fan your inner flame! An anonymous cheerleader with pearls of wisdom?There is joy in stopping to smell the blooms! My cheeks are as pink as the flowers in this lovely garden. Thanks everyone! I love this place! You gardeners are AWESOME!! Loved hearing from Laurie, one of the best friends I've never met. I haven't told you, but I had a friend whose family had an experience with a cardinal after her grandmother's death. It even perched on her uncle's shoulder as he mowed the grass.Thanks Marie Elena and Walt for the interviews. Nancy- I cherish our friendship, too. Thanks for sharing your friend's cardinal joy! Fascinating interview. Searching questions and enlightening answers.